These buñuelos have stolen my heart. You can find them at Tinto restaurant tucked away in the Saguaro Hotel in Palm Springs. They are an hour and a half drive outside of LA but so worth the trip and a great excuse to visit beautiful Palm Springs. And hey it’s Coachella weekend so why not visit Tinto while you’re in town. I know I will! These delectable doughnuts are fried to perfection with a delicate sugar coated crust that gives way to a rich and soft center. 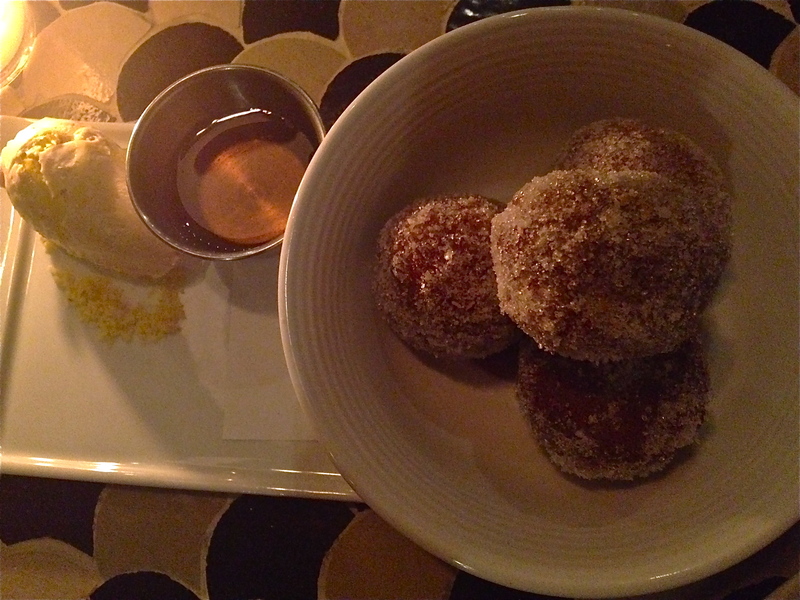 They are served alongside spiced honey, date jam and a refreshingly delicious date olive oil ice cream. The pairing of honey, spices and sweet dates was incredible. A bite of buñuelo, jam, honey and cold soft olive oil ice cream and you’re in heaven. It is a stellar combination of flavors and textures that will make your mouth curl up in a big smile as you sigh from the sweet satisfaction. These are some of my favorite buñuelos to date. I am eating breakfast whilst reading this. Would love to have one now! Miss K – these would be so good for breakfast!